The Legendary Rhine-Romantic Route stretches for approximately 586 km on both riverbanks between Düsseldorf and Mainz linking over 100 places where Germany's best-loved myths, sagas, fairy tales and legends are set. Traces of these legendary stories can also be found, however, along the Moselle, Lahn and Nahe rivers. Travel the Legendary Rhine-Romantic Route and go on a journey of discovery through the myths and legends of the romantic Rhine Valley between Düsseldorf and Mainz. Impressive countryside can be found anywhere, however it is the melodrama of the Middle Rhine landscape combined with its stories of human passions and destinies that really set it apart. It is along Germany's largest river that ancient myths, romantic sagas and wondrous legends are truly brought to life – just think of the Heinzelmännchen, the little elves of Cologne, the struggle between Siegfried, the hero of the Nibelungs, and the dragon on Drachenfels hill or Saint Hildegard of Bingen and the monastery of Disibodenberg. You can also visit the Mouse Tower (Mäuseturm) at Bingen, view the "eye roller" (Augenroller) plaque on the old department store (Altes Kaufhaus) in Koblenz and hear the legend of how Marksburg Castle at Braubach got its name. Between the Rhine and the Nahe river, you can delve into the origins of the German Michael (Deutscher Michel), the national personification of Germany, or discover how many grains of truth are contained in the Trübenbach saga at Kirn. However without doubt, the most memorable and famous tale is that of the blonde and alluring Lorelei who lived on the Lorelei rock near St. Goarshausen. The Eberbach Abbey and the spring waters at Wiesbaden offer a rich source of discovery in Rheingau, whilst in Mainz you can explore the legend behind the city's coat of arms. If castle walls could talk...! The route leads through breathtaking scenery to gorgeous locations that inspired the works of the Rhine Romantics as long ago as the early 19th century. But don't let your thirst for unravelling mysteries and legends distract you from the many other places of interest. Here, where the Rhine carves its way through the slate mountains between Bingen and Koblenz, you're also in the Upper Rhine Valley UNESCO World Heritage site, an area full of castles that embody the German Romantic tradition. Geisenheim: "the Marienthal pilgrimage site, the Late Harvest Rider (Spätlesereiter) statue"
Münstermaifeld: Eltz Castle, "the maid in the castle"
The Rheingau Music Festival presents a series of fantastic concerts ranging from serious music to sophisticated entertainment, covering virtually every era, style and genre along the way. 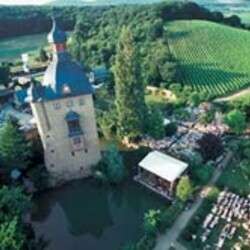 The 150-plus concerts that take place at around 40 venues in the Rheingau wine region are attended by over 120,000 visitors. The venues, located between Wiesbaden and Lorch, include palaces, churches, abbeys, wine estates and the river Rhine itself. Toate informaţiile referitoare la preţuri, datele următoarelor reprezentaţii şi la programul cu publicul fără garanţie.